New roof substructure is built in preparation for new metal sheeting. Repairs to the local primary school that was damaged when a windstorm struck in May are expected to be completed before the end of the current school year. In May a violent windstorm ripped the metal roof off the school and caused structural damage to the walls. 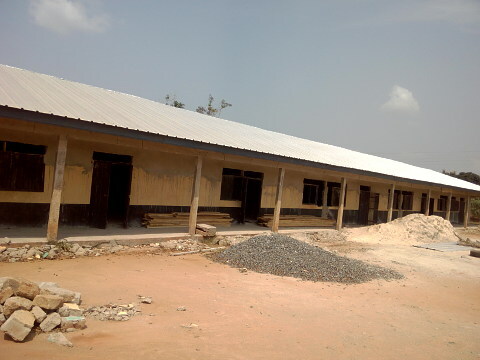 Students were moved to makeshift classes set up in the open or in a partially completed building for the junior secondary school that was started years ago but never completed. In order to get children back into a proper facility as soon as possible the village initially considered raising its own funding and providing community labour to repair the damaged building or tear it down and rebuild it. But appeals to the local district government unexpectedly bore fruit, and funding for the repairs was approved in an exceptionally short time. In a recent interview, Torgbui Klu Agudzeamegah II, chief of Dagbamate, said that the Akatsi South District Assembly was informed of the damage in a letter soon after the storm. At the time the office of the district chief executive was vacant and nothing could be decided until the office was filled. 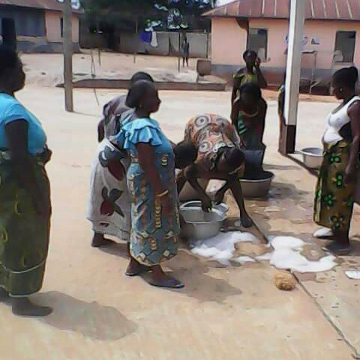 When the new district chief executive, Leo Nelson Adzidogah, was appointed in June he immediately visited Dagbamete to see the damage for himself. Funding to repair the school was then approved quickly and the work begun. To date the walls have been raised and strengthened with reinforced concrete, and a wooden structure to support the roof is in place. Once the roof is completed, the electrical work, windows and doors, plastering and painting come next. Torgbui Klu said it was the lobbying of the elders and the school management committee that led to the good result. The quick action by the district government is a testament to the determination and resourcefulness of the community and its leaders that have driven development in the village for more than a century. 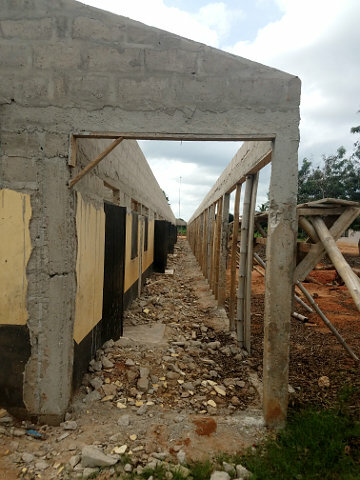 The money raised in a fundraising campaign to repair or rebuild the school will now be put toward completing an unfinished junior secondary school building. Work on the JSS school building was halted five years ago when the government failed to pay the contractor for work done. Completed east side of the roof. UPDATE (December 4, 2017): Work to repair the damaged school roof was halted after one side of the roof was completed. The contractor claims that the government failed to pay for work. 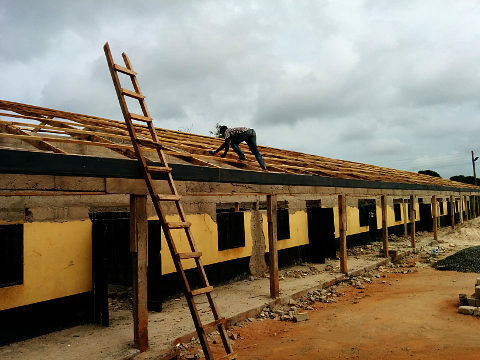 In a post in a village online discussion forum, Sammy Davor, secretary of the village, points out that had the contractor been instructed to replace both sides of the roof at the same time instead of replacing one side at a time then at least some of the classrooms could be used. With only one side of the roof completed the classrooms will remain empty until work is resumed. Unfinished west side of the roof after the contractor halted work when the government failed to pay for work. According to Mama Adzorhlor III, Queen Mother of Dagbamete, government failure to pay contractors is an all too common pattern in the district. Not only did the junior secondary school building suffer the same fate five years ago, the government failed to pay for work done to improve a key road between Akatsi and Avenorpeme, a project that has since remained idle for more than a year. The road which passes through Dagbamete is in very bad condition, adversely affecting travel to and from the village. As of January 2018 the roof is completed but doors, windows, floor, painting and clean up remain to be done before classes can resume in the wind-damaged section of the school. UPDATE (January 25, 2018): Work to repair the damaged school was resumed late 2017. According to Kudolo Popper, a teacher at the school's ICT centre, the project is now about 70% finished. Dignitaries arriving to the 4th annual Atsiame festival. Leadership and development was the theme of this year's Atsyiamedukor festival, the fourth annual gathering of the Atsiame clan held last month in Dagbamete. 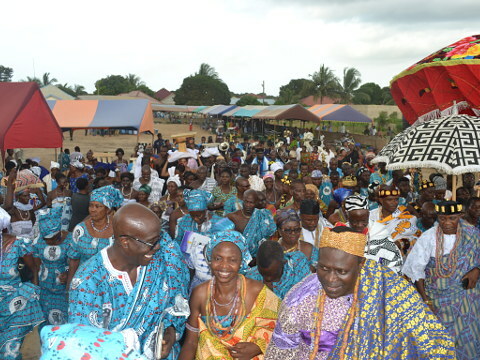 The festival, which attracted at least 500 people, was co-hosted by the paramount chief of the clan, Torgbui Samlafo IV, and by Torgbui Klu Agudzeamegah II of Dagbamete. 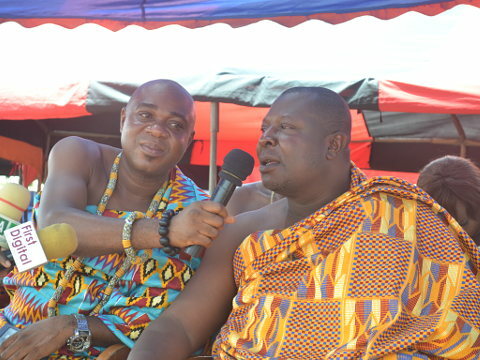 Torgbui Adzonugaga Amenya Fiti V, paramount chief of the Aflao traditional area, was the chairman. With many of the 59 chiefs of the clan in attendance, Torgbui Samlafo embraced this year's theme, "The traditional ruler as an agent of development." He stressed the importance of developing and guiding the next generation of leaders. To this end, education, he said, is vitally important, and he announced that an education fund established for the clan's youth is growing and is expected to begin disbursing funds next year. Women carrying the traditional items for the festival. He observed that drinking and smoking are destroying the youth of today and urged the government to launch a national crusade to educate youth on the dangers of these social vices. He lauded the government's job creation agenda through its One District One Factory programme which will provide job opportunities for the youth. The clan, he announced, is "very ready to provide land for such project." He offered two suggestions for the government to consider. One is a processing factory for fruit grown in the area and the other is a quarry to exploit the area's rock deposits with an associated block factory to produce high quality blocks for the construction industry. He told the gathering that the promotion of peace in the district is one of the objectives of the Atsyiamedukor. He urged the chiefs to avoid resorting to the courts to settle disputes among them and use instead the clan's arbitration and settlement process. This saves money which can be used for development instead. He said court rulings "do not make peace" as they are "often challenged" at great expense. Chairman of the festival, Torgbui Adzonugaga Amenya Fiti V, paramount chief of the Aflao traditional area, welcoming the attendees. 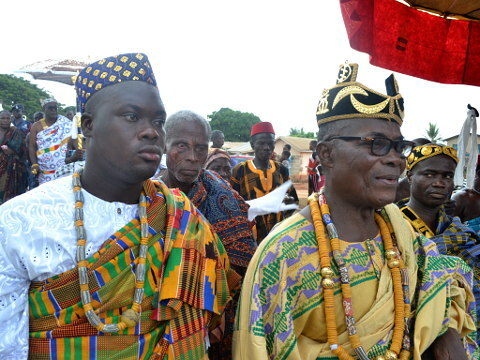 Torgbui Samlafo noted that two chiefs of the clan were lost in the past year: Torgbui Kutor of Lume-Aklikope and Torgbui Dzamedzi Nyakpo of Lume-Avete. But he also noted that four new chiefs were enstooled on vacant stools: Torgbui Gorni Trevi of Dzogadze, Torgbui Katsekpor of Ayitikope, Torgbui Akplor of Akplorkope, and Torgbui Togona of Dzuerpe-Atsyiame. In his address to the gathering, Torgbui Klu Agudzeamegah stressed the importance of self-help and community labour for maintaining a clean environment. He urged the chiefs to mobilise the youth in all the Atsiame towns and villages. He implored clan members to dispense with outdated funeral practices. He said that the practice of keeping the dead in the mortuary for months and spending fortunes on funerals are unnecessary and wasteful, and the money saved could be better spent on educating the youth. Torgbui Klu also drew attention to the poor state of roads in the district, as he has at past festivals. He singled out the road from Akatsi to Suipe that passes through Dagbamete and Avenorpeme which is in a "very bad state." Work on this road was begun last year but was abruptly stopped. Torgbui Klu appealed to political leaders "to ensure that this road is completed." Mama Adzorhlor III and Torgbui Klu Agudzeamegah II of Dagbamete leaving at the conclusion of the festival. Henry Samlafo, brother of paramount chief Torgbui Samlafo IV, is accompanying Mama and Torgbui on the left. The venue for next year's festival will be Dagbamete again. The original idea for the festival was to rotate responsibility for hosting it among the towns and villages of the Atysiamedukor. 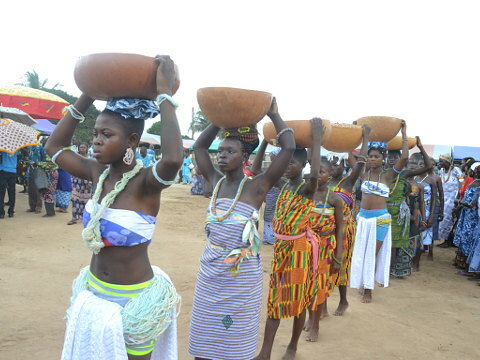 But as three of the four festivals held so far have been in Dagbamete, it appears that Dagbamete is the community most able to stage the event. Next year the event will be moved to the last Saturday of October, on the same weekend as the Midyear festival. This change is being made so that those who want to attend both festivals need not make two separate trips to the village. A large cache of buried cowry shells was recently discovered in Dagbamete. Cowry shells were once used as a form of currency, and a cache of this size represented considerable wealth. It is commonly believed that the ancestors buried cowry shells in various secret places around Dagbamete and intended them to be discovered by later generations with the guidance of the ancestral spirits. The spirits are said to mysteriously direct individuals to dig where cowry shells are buried. Sometimes the direction where to dig is revealed in a dream. On the other hand, if the spirits do not want a cache of shells uncovered they may direct someone inadvertently digging at a burial site to dig somewhere else. Cowry shells are the shells of large sea snails found in the Indian Ocean. In West Africa cowry shells were highly valued as symbols of wealth and strength, but their use as currency eventually gave way to modern currencies in the 19th century. The national currency of Ghana, the cedi, is named after the snails in recognition of the historical importance of their shells. Today cowry shells are mainly used for ritual beads and in jewellery. 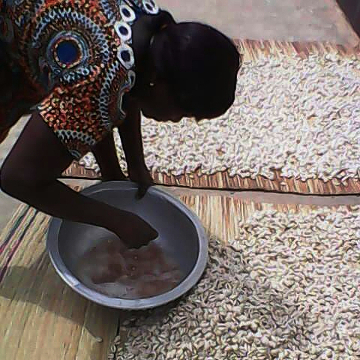 Washing cowry shells found buried in Dagbamete. Drying washed cowry shells in the sun. Villagers express their gratitude to the ancestral spirits for the recently discovered cowry shells and vow to ensure that the cache of shells will be kept safe. 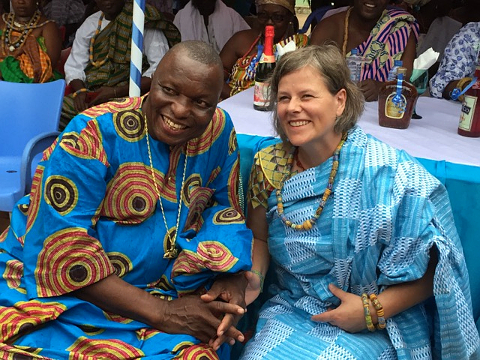 Newly installed village elder Kathy Armstrong with Professor Kwasi Dunyo at the inaugural Festival of Friends held in Dagbamete. In July the village celebrated a very special friendship that goes back more than a quarter century. Sparked by a visit of a Canadian woman who came to the village to study African music, the friendship blossomed as she returned to the village many times to study with a master drummer. Before long this woman, Kathy Armstrong, would bring friends, family and her own students to the village. The master drummer, Kwasi Dunyo, a distinguished son of the village, would in turn be invited to teach in Canada. The festival was the brainchild of Kathy and Kwasi. Many people from Ghana and Canada were invited, including members of her group, the Baobab Youth Performers from Ottawa. 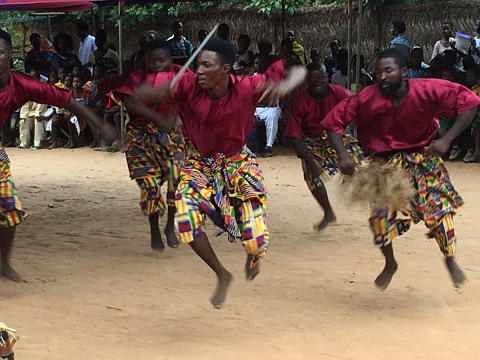 During the weekend of ceremony, music and dance, the Baobab Youth Performers gave a performance of their own. 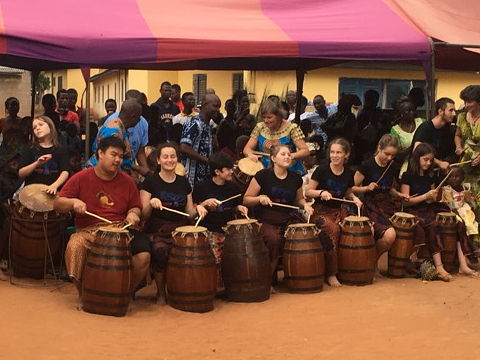 As Kathy later said in a radio interview, "when the youth in Dagbamete see youth in Canada that are really interested in their drumming and are coming there to study... it gives them extra pride in something that they have right at their finger tips." 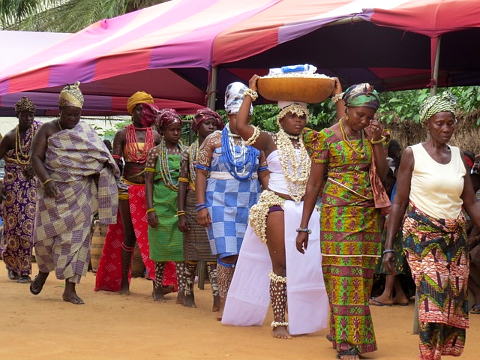 Procession of women in traditional dress arriving at the festival. Baobab Youth Performers perform traditional Kinka drumming music. CBC Radio interview of Kathy Armstrong, artistic director of Baobab Tree Drum Dance Community, and now elder of the village of Dagbamete. Kathy was interviewed by Giacomo Panico for the Ottawa Morning program broadcast on August 15, 2017. The Festival of Friends, held July 21-22, was meant to be a celebration of friendship, but the village had a surprise for Kathy. At the start of the opening ceremony it was announced that she would be appointed an elder of the village. Although completely unexpected, Kathy accepted the honour, and was installed in a stool ceremony with her dressed in traditional Ewe kente cloth and wearing traditional beads. As the chief of Dagbamete, Torgbui Agudzeamegah II, explained in his welcome message, the development of the community progressed significantly through the efforts of Kathy and the Canadian, American and Bermudian friends who followed, all of which was sparked by Kathy's visit more than 25 years ago. In recognition of her pivotal role, Kathy was made a member of the Council of Elders "to advise on cultural and educational issues." Asked in the radio interview whether becoming an elder comes with "any special responsibilities, any extra jobs," Kathy told radio host Giacomo Panico: "I am sure that the expectation is that I will continue to go back and bring people." "Because I am no philanthropist — I am a freelance musician — I haven't poured a lot of money into the village. But I think it's really about the connections and the people, and so it's really an opportunity just to celebrate that." Kathy was previously honoured with a traditional Ewe name. In 2011 she was given the name "Mama Yenunya," in honour of a strong grandmother of the village, the mother of the five brothers who established the five lineages to which most of the villagers today can trace their heritage. Because so many connections to the village from Canada and elsewhere can be traced through Kathy it is only fitting that she was honoured with Mama Yenunya's name. While others have been honoured with traditional names before, no other foreigner has been made an elder of the village. In her message to the festival, the Queen Mother of Dagbamete, Mama Adzorhlor III, said that Kathy showed even a woman could become a great master drummer. To young girls of the village, Kathy is an inspiration, and girls who have "the potential to become a doctor, a teacher, a farmer or a drummer should not be held back from realizing their dreams because of tradition." "We must not let our traditions dry up and become brittle like the branches of a dead tree," the Queen Mother said. "The winds of change are all around us, so our traditions must never fail to bend like a living tree." On the importance of the traditions for today's youth, Mama Adzorhlor said: "As our sons and daughters leave the village to go to school, to pursue careers, and for business, we must make sure that they know the traditions, so they know their ancestral roots. They must know the value of the traditions so they don't throw them away as worthless. When they know their roots they will come back to the village." "In the West, people have money and live comfortable lives. But they are starving for what we have. We have a rich culture, and a caring community. We share our food and drink, we laugh and cry together and we support each other. It may be hard to believe, but people in the West are lost with empty hearts because they have lost their traditions." It is hoped that the Festival of Friends will be celebrated in the village every few years. We look forward to the next one! 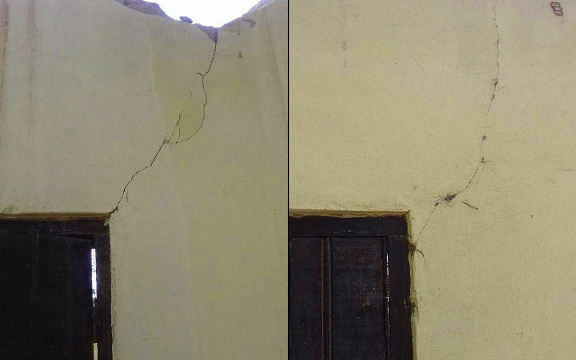 Cracks around windows and doors throughout the classroom block at Dagbamete Basic School indicate structural damage caused by a severe wind storm in early May was more serious than first thought. 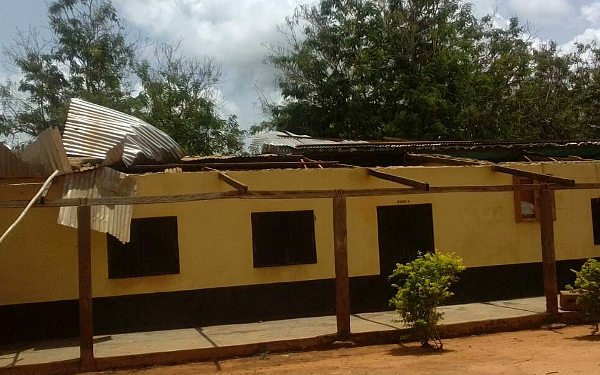 Structural damage to the main classroom block at Dagbamete's primary school caused by a severe wind storm in May is much more serious than originally believed. 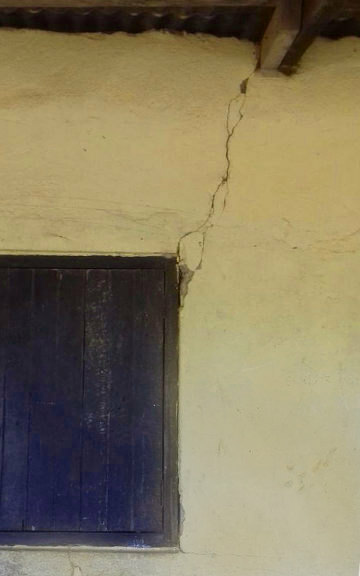 A damage assessment revealed there is evidence of cracking in walls throughout the classroom block, leaving the building in a weakened state and likely to collapse unless major structural repairs are made. Davor Wonder, an engineer from Dagbamete but now living and working in Kade, in Eastern Region, said that the structural damage is serious enough that he will recommend to the Chief of the village, Torgbui Klu Agudzeamegah II, that the building be torn down and replaced with a new classroom block. Even with all the visible damage repaired, the building will still be left in a weakened state and could suffer further damage and even collapse in the event another storm of similar severity. He said that a new building will not cost much more than the cost of repairing the damaged building. He estimates that the cost of materials and labour to repair the damaged building would be GHS 80,000 ($18,400 USD). The materials for a new building will be about GHS 60,000 ($13,800 USD), and if the community pitches in and provides most of the labour, the cost of labour will be kept to a minimum. If labour has to be hired he estimates the cost will be much higher, about GHS 300,000 to 400,000 or more. But Davor is optimistic that the community will rally around the project at the behest of the community leaders and will do much of the work as a service to the community. Bent roof beams that would need to be replaced. Davor said that of the seven classrooms of the building, six suffered extensive damage including roof damage and cracks in the walls while the seventh has multiple cracks around the windows and doors. If the building were to be repaired, the walls would have to be demolished down to the window level. Other repairs required include replacement of the roof beams and replacement of the concrete floors of the veranda. The cost of demolishing the damaged building and removing of the waste material is not included in the estimates. As in the case of the construction work, Davor believes that the community will provide most of the labour at little or no cost. 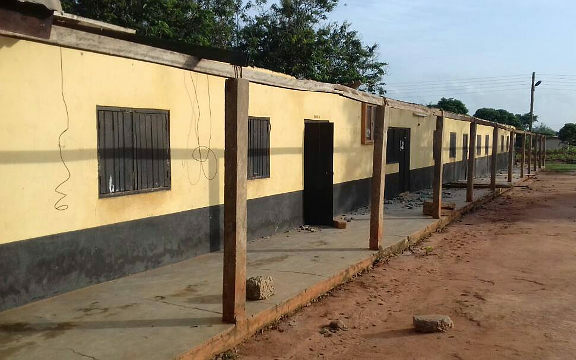 Asked whether the Ministry of Education would bear the cost of rebuilding the classroom block, Davor said that in his experience requests to repair or rebuild schools can sit on someone's desk for three of four years before anything happens. He said that the community does not want to wait and jeopardize the education and safety of children while officials sit on the paperwork. Anyone wishing to donate to the rebuilding effort may contact Sammy Davor at sammydavor22@yahoo.com. Roof of Dagbamete primary school badly damaged by winds in a storm that swept through in the beginning of May. 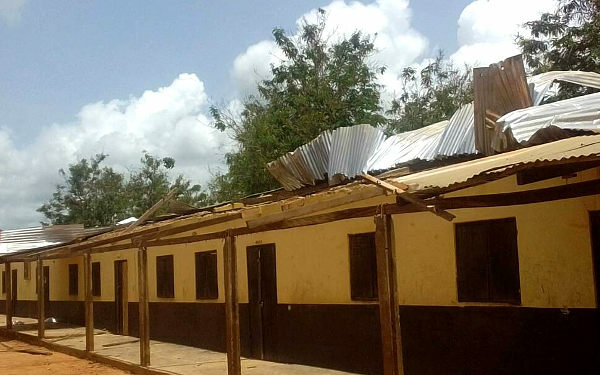 A fierce storm with high winds swept through the village of Dagbamete in early May causing severe damage to the local primary school. 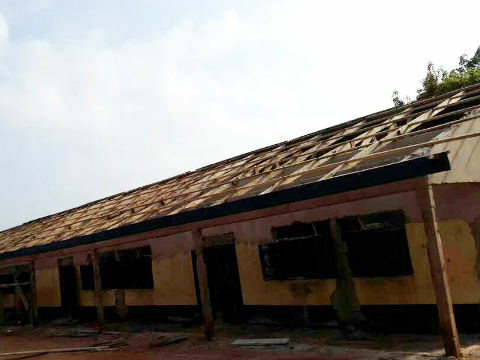 Its metal roof was ripped up, exposing classrooms to the elements. Because the storm occurred on a Sunday when the school was empty, no injuries were reported. Some classes have been cancelled and children are at home unable to continue their education. The Chief of the Dagbamete, Torgbui Klu Agudzeamegah II, and the Queen Mother, Mama Adjorhlor III, have asked friends of village to donate money for the repairs. The repairs are expected to cost GHS 80,000 ($18,400 USD). According to Professor Kwasi Dunyo, who has been assisting in the efforts to raise funds, the repairs will require more work and materials than just replacing the damaged metal. The underlying structure that supports the roof needs to be replaced and strengthened so that the new roof will withstand wind storms in the future. Torgbui Klu has appointed Sammy Davor, an elder of the village, to collect donations. Extensive damage to the roof has forced the cancellation of classes while the village raises funds for repairs. The school was built by the village without government assistance, although it is operated as a government school. 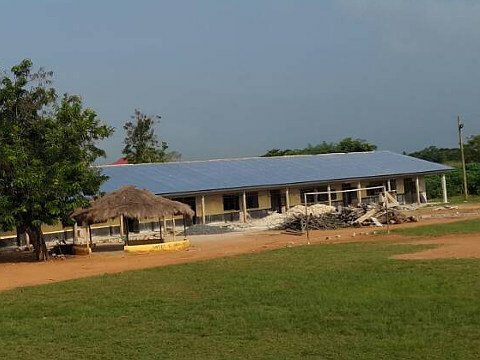 In Ghana, especially in rural areas, the government does not provide the all inclusive funding and support for schools that is common in developed countries, and communities often have to take the initiative to build and maintain schools on their own in order to ensure adequate education for their children. Dagbamete is notable for the support its citizens have given to various development projects in the village, the most recent being the building of a community hospital two years ago. It is hoped that the repairs will be completed before the beginning of the school year in September. Anyone wishing to donate to the repair effort may contact Sammy Davor at sammydavor22@yahoo.com.